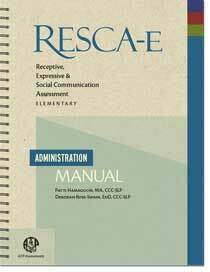 Based on current research and designed for today's child, the RESCA-E was developed to provide essential information to professionals and parents about a child's receptive, expressive, and social communication language skills. It targets critical areas of language development which are often included in IEPs and treatment plans but are difficult or impossible to objectively measure with existing tests for the elementary-age population. The RESCA-E combines standardized tests with informal observation across different settings to give a more complete picture of a child's communication skills. The SCI is a 28-item behavior rating scale that gathers information on how a child interacts with others across settings. It provides a more holistic picture of a child's social communication skills and can be completed by either parents or professionals. RESCA-E core subtests can be administered in one hour or less. Scaled scores are provided for subtests; standard scores are provided for cores and the overall score. Discrepancy scores allow comparison of performance across subtests. Reliability and Validity information provided in the Product Information box on this page. Data collection was based on a nationally representative sample of 825 children ages 5-0 through 12-11 years. Results of reliability and validity studies are provided in the technical manual. of what matters in the evaluation of children… Each item is intended to measure something substantial and relevant to everyday functioning. It seems to provide a more complex picture of a child's social communication, understanding expressions of speech, context, tone of voice, and facial expression. My SLPs are really enjoying using this test.